Summer’s over, and it’s been crazy. So, to start the school year off right, I needed some rejuvenation. As it’s not always cost- or time-effective to hit a day spa, I thought I’d make a quick run to the grocery store and create my own simple products to replicate a relaxing day at the spa. There are SO many options for d.i.y. face masks and hair treatments, I could fill an entire website. But I’m starting here with the basics. Perhaps I’ll do another post some time in the future with further suggestions for a spa-in-a-grocery-bag. Project Costs: I had all of the above ingredients already in my cupboards/fridge, but it’s really only about 5 bucks for a nice spa treatment for one. There are many food or drink ingredients you can put in your hair that perform various functions – raw eggs, yogurt, lemon juice, beer – but the thing that has always worked for me has been mayonnaise. It restores moisture and shine to hair and, after all the swimming and sunshine I’ve had lately, my hair needs it. Just dip a spoon into your mayonnaise, put it on your hand and slather it on your hair. Work it in well so it penetrates every shaft of hair. You don’t want to have lovely hair on top and brittle, dry hair underneath. 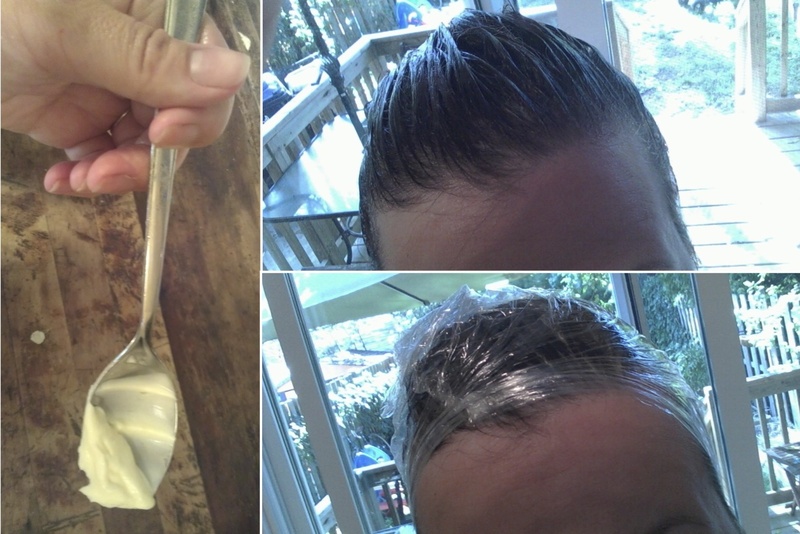 Once you’ve covered your hair with it, grab some Saran wrap and wrap it around your head, sealing it to allow the mayonnaise to warm up a bit and really get deeply into the hair follicles. Leave it on for at least 20 minutes, and up to an hour and then wash it out. To really get it out, you’ll need to shampoo it, but I like to hold off on the shampoo for a couple of days. Your hair will look a bit greasy but the benefits, in the long run, are worth it. By the next time you do shampoo your hair, it will be so soft and lovely feeling you’ll want to touch it all the time. While you’re waiting for your hair to be mayonnaised, you can get started on your tasty facial. On this hot, sweaty day I decided to create a face mask that would reduce the oil on my skin and make me all fresh-faced. I mashed up half an avocado, and stirred in an egg white and about a tbsp of fresh lemon juice. 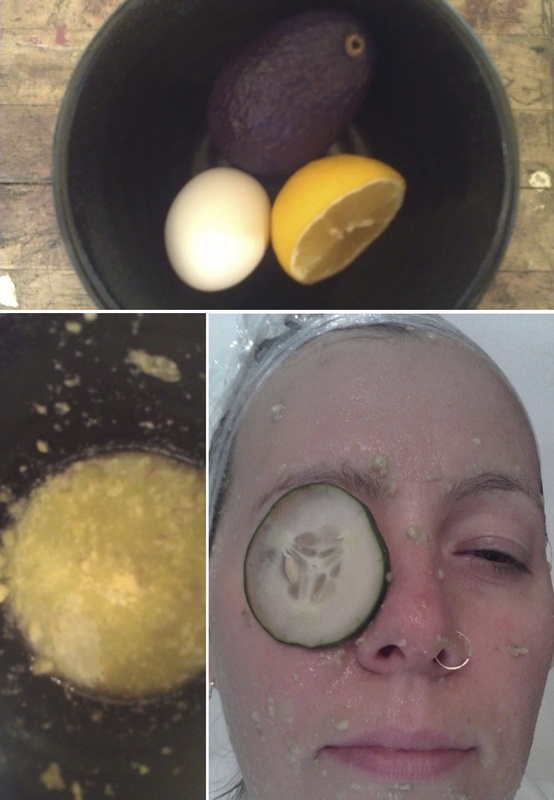 I then applied it to my face (avoiding my eyes of course – lemon juice in the eyeball is not a way to look fresh-faced), cut up a couple of cucumber slices and laid them on my eyes, sat back and relaxed for about 15 minutes. When I woke up, I composted the cucumber slices (you can eat them if your nap made you hungry) washed my face off with lukewarm water, patting it dry with a towel. My next step was into my pantry to collect the olive oil, sunflower oil, and granulated sugar. I dabbed some olive oil onto a cotton pad and rubbed it into my fingernails and cuticles. It adds a sheen and moisture to the nails, and conditions the cuticles. Remember that the next time you’re making pasta sauce. A little for the tomatoes, a little for your fingertips. I then dumped some sugar into a little container and added the sunflower oil, until I had a very thick, paste-y mixture. I took this into the shower and, as I was rinsing the mayo from my hair, I rubbed the sugar slough onto my flip-flop-roughed up heels. The sugar rubs away dead skin cells and the oil moisturizes your (my) tired old feet. It felt so nice that I put some on my elbows, too. And there was still some left over so I rubbed it on my bum. I’m pretty sure I now have the softest bum in the city. Trust me. From: Host(ess) Gifts, Party Time!